Good Morning Green Panda Friends and Happy 4th of July week. On Wednesday we will all celebrate the independence of the United States of America. Independence Day is a time to celebrate all forms of independence; some of us may also be searching for our own independence whether it is financially, professionally, or personally. If you want to enjoy your independence this 4th of July and if you want to save some money at the same time then check out Green Panda’s list of fun things to do this 4th of July. 1. Watch The Fireworks. Whether you chose to watch the fireworks on television in the comfort of your own home or if you chose to watch the fireworks in a local park or waterside it is definitely cheaper to watch a public display of fireworks than it is to buy your own fireworks. 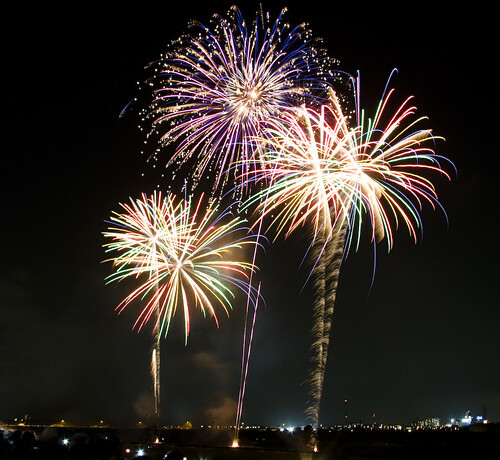 Although fireworks are very exciting they are also very expensive, so if you want to celebrate the 4th of July with a bang we suggest that you check your local listing for public firework displays. 2. Go To a Planned Event. Many parks and local communities will be celebrating the 4th of July with various activities. It is a lot cheaper to attend an already planned event or amusement park than it is to host your own party. Even if your guests bring their own alcohol the cost of food and fireworks can be very expensive. 3. Go Outside with Friends. If the weather is nice on Wednesday you can get some friends and spend the day outside while you enjoy the sunshine. If lying around in the hot sun or reading a book in the summer sunshine isn’t really your idea of a fun way to spend the afternoon then you can always grab some friends and play volleyball, baseball, or soccer in a park. Outdoor activities are a great way to spend the day with friends. 4. Hit The Beach. Although the beaches may be very crowded this 4th of July due to the recent heat waves it is still a fun way to spend the day and celebrate the independence of the United States of America. Spending a day at the beach is a good idea because if we get too hot we can go and cool off in the water at anytime. I love throwing around a beach ball or playing Frisbee on the beach and then taking a swim in the water to refresh. 5. Pack a Lunch. Regardless of how you choose to spend this 4th of July it is a smart budget friendly idea to bring your own lunch and snacks. Trying to bring your own drinks may not be such a good idea because your cool refreshments may be warm before you even arrive at your 4th of July destination. Most parks, amusement parks, beaches, and public shared spaces allow visitors to bring their own food and snacks but not alcohol.